Great news from Italy – Francini’s Dolce Amore (Multi Ch Shavian Hey Presto – Zagara Zuma della Kalesa) became ITALIAN FIELD TRIAL CHAMPION !!!!! XXL of Black Mirage was 3rd best male with CC, and can now hold also the title SU(u) Ch !!! 113 cockers were entered and the judge was Mrs G. Flyckt-Pedersen. 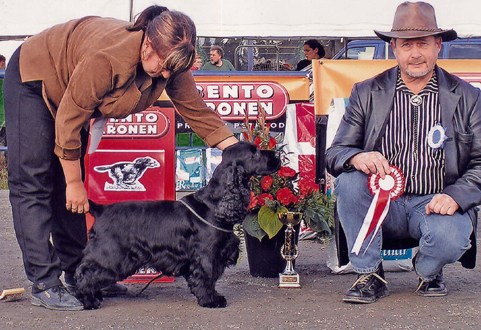 The Finnish Spaniel Club’s The Cocker of the Year 2004 Int Ch XXL of Black Mirage !!!! And no 2 Ch. Shavian Hey Presto !!!! XXL of Black Mirage BOB & BIG3. 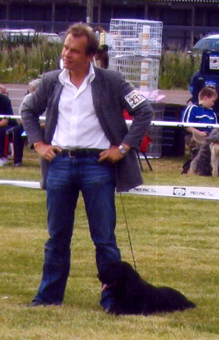 The breed judge was Mr Markku Santamäki from Finland. XXL of Black Mirage BOB. 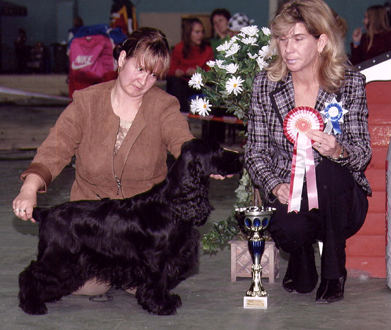 The breed judge was Mrs Tarja Hovila from Finland. XXL Of Black Mirage was BOB & BIG1 !!! Shavian Hey Presto was 2nd best male. 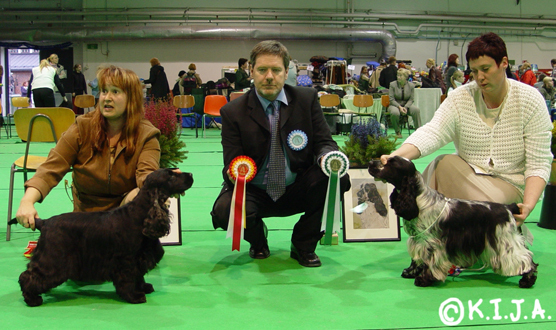 The breed judge was Mr Giuseppe Alessandra from Italy and the group judge Mrs Paula Rekiranta from Finland. Shavian Hey Presto was BOB and gained his 23th cacib. The judge was Mrs Jean Lanning from Great-Britain. Waterwood The Diplomat was BOB & BIS2!! The judge was Dr. Ladislav Svatos from Czech. XXL of Black Mirage had again a great day. He was BOB, BIG & BIS3!! 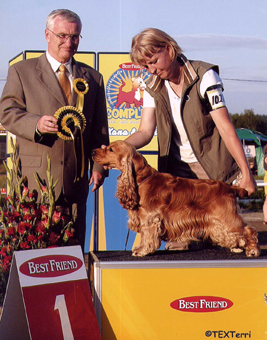 The breed judge was Mr Laszlo Erdös from Hungary. The group judge was Mr Harri Lehkonen from Finland and BIS judge was Mrs Natalia Nekrosiene. XXL of Black Mirage was BOB & BIG3. The breed & group judge was Mr Kim Bay from Denmark. XXL of Black Mirage was BOB, BIG & BIS1 !!! The breed & group judge was Mr Jose Homem de Mello from Portugal. BIS judge was Mr Ove Germundsson from Sweden. Shavian Soul Mate gained CC, cacib & BOS. The judge was Mr Hans Müller. Shavian Golden Rule made my day, he gained 3rd CC, and was also BOB, BIG & BIS2!!! Congratulations to his owner, Ms Maarit Flinck, well done ! The breed & group judge was Mr Charles Bett from Canada. XXL of Black Mirage was 2nd best male and got res.cacib. The judge was Mr Rui Oliveira from Portugal. XXL of Black Mirage gained his Finnish CC, he was also BOB & BIG3. The breed judge was Mr Gerard Hickey from Ireland. Ch. Shavian Hush-Hush gained cacib, and she was also BOB & BIG3. Her brother Ch. Shavian Hey Presto gained also cacib and was BOS. The breed judge was Mr Jose Homem de Mello from Portugal, and the group judge was Dr Tamás Jakkel from Hungary. Int & H Ch XXL Of Black Mirage, owner Dr. Tamás Jakkel, arrived to Finland. He will stay with me for some time to be shown & for some stud work. Thank you Tamás for letting me have him here. Shavian Golden Rule gained his 2nd CC. The judge was Mrs Moa Persson from Sweden. Ch. Shavian Hey Presto was BOS. The judge was Mrs Marit Sunde from Sweden. Shavian Golden Rule (owner Ms Maarit Flinck) gained CC, and he was also BOB. Ch. Shavian Raindrop (owner Ms Minna Myllyniemi) was BOS. Congratulations Maarit and Minna, well done. The judge was Mr Benny Blid from Sweden. Ch. Shavian Raindrop (owner Minna Myllyniemi) was BOS. Ch. Shavian Hey Presto did it also today. He was BOB, BIG & BIS3!!! Ch. Shavian Hush-Hush gained cacib and was also BOS. The judge was Mr Jos De Cuypen from Belgium. Ch. Shavian Hey Presto got CC, cacib and was BOB. The judge was Mr Giuseppe Alessandra from Italy. Ch. Shavian Hey Presto was BOB.